It's not too late to sign up for October's Hang 'Em Dry Challenge where you can pledge to line or otherwise air dry all your laundry for the month. I'm trying to get at least 100 households to pledge to not use their dryers for the month. If 100 households don't use their dryers for a month it will save ~11,100 pounds of CO2 emissions. That's 5.5 tons of carbon! If you could tweet or Facebook or otherwise help out I would be much appreciative! "Join 100 families to save $ and 5.5 tons of CO2 by air drying your laundry in October's Hang Em Dry Challenge: http://tinyurl.com/27khd9a"
You can also help promote the line drying laundry challenge by adding the pledge badge to your blog. The code can be found on the main challenge page. Wow! I can't believe it! Thank you so much. It is my birthday, today. What a wonderful surprise! Congrats and happy birthday to Caron! How many people constitute a "household"? I don't think I am one, all on my own. But I'm gearing up for no dryer usage except to partially dry sheets & towels. 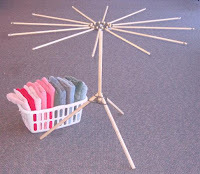 this looks like a wonderful drying rack. A couple months ago I bought a wonder wash, that is how I do my laundry, no power at all. Then I use a spinner that is electric, made by The Laundry Alternative- it works great. Then all my clothing is hung to dry. So you have my pledge because I already am doing what you ask. I sure could use a better rack though. I am participating and also tweeted for you. I'll be writing up a post about it later this weekend, too.